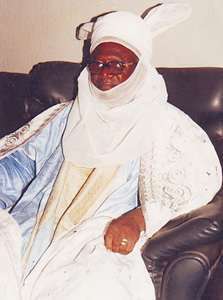 Nigeria Senate President, Dr. Abubakar Bukola Saraki today (Saturday) described the late Emir of Keffi, Alhaji Muhammadu Chindo-Yamusa II, as a man of peace whose long reign witnessed phenomenal development in the ancient Keffi Emirate in particular, and Nasarawa State in general. In a statement issued by Special Adviser to the Senate President on Media and Publicity, Yusuph Olaniyonu, Saraki received the news of the passing on of the Emir with shock and sadness. He said while Saraki thanked God for the exemplary life and progressive disposition of the royal father, he commiserated with the immediate family of the deceased, the Keffi Emirate as well as the Government and people of Nasarawa State over the irreparable loss. The Senate President urged them to be consoled by the fact that the late Monarch lived a selfless life and was a father to all, irrespective of religion, ethnicity or political affiliation. “Late Alhaji Muhammadu Chindo-Yamusa II, was not only a man of peace but a lover of his people. He stood firmly for what he believed in. To him, the interest of the people of Keffi was paramount in all his dealings. “The late Emir will be sorely missed by all those who knew him. I pray to Allah to forgive his shortcomings and reward his good deeds with Jannatul firdaus,” Saraki stated. He called on the people of Keffi and Nasarawa State to emulate the virtues of tolerance exhibited by their late traditional ruler throughout his earthly sojourn.